Nationalism, War and Jewish Education explores historical circumstances leading to the emergence of a Jewish religious school system lasting to modern times and the process by which this system was broken down and adapted in secular form as Jewish nationalism grew in the 19th and early 20th centuries. In the Roman period, education became an essential part of rabbinic pacifist accommodation following Jewish defeats, while in the modern period, secular education was associated with nationalism and increasing militancy of emerging states. In both periods there was a revival of Hebrew and the creation of an educational system based on Hebrew texts. Both revivals were responses to anti-Semitism, which pushed large numbers of Jews away from assimilation into the dominant culture to a renewed Jewish national identity. The book highlights the centrifugal and centripetal shifts in Jewish identity, from messianic militarism to pacifism and back. It shows how changes in Jewish education accompanied these shifts. While drawing on historical scholarship for background, this book is essentially a literary study, showing how literary changes at different times and places reflect historical, socio-psychological, economic and political change. 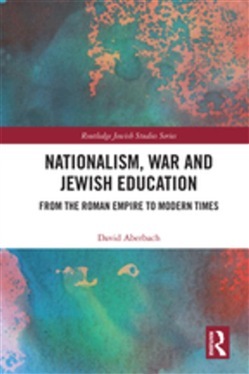 Nationalism, War and Jewish Education is original in showing how ancient Jewish education affected modern Jewish society, therefore it is a valuable resource for students and researchers interested in Jewish history and literature, education, development studies and nationalism. Acquista Nationalism, War and Jewish Education in Epub: dopo aver letto l’ebook Nationalism, War and Jewish Education di David Aberbach ti invitiamo a lasciarci una Recensione qui sotto: sarà utile agli utenti che non abbiano ancora letto questo libro e che vogliano avere delle opinioni altrui. L’opinione su di un libro è molto soggettiva e per questo leggere eventuali recensioni negative non ci dovrà frenare dall’acquisto, anzi dovrà spingerci ad acquistare il libro in fretta per poter dire la nostra ed eventualmente smentire quanto commentato da altri, contribuendo ad arricchire più possibile i commenti e dare sempre più spunti di confronto al pubblico online.